As anyone who has googled the term “gamification” knows, it’s an e-learning industry buzzword that can apply to a lot of different processes and many different ideas of “gamified” learning. At its heart, the best gamification definition is the application of game mechanics to online learning to increase engagement. One popular example of gamified learning is the Duolingo language app. This app teaches languages using basic game mechanics. It awards points for correct answers, badges for regular logins, and users are even given a percentage of fluency as they progress. Duolingo can also give users instant feedback and even allows them to practice pronunciation via their microphone. A report (paid for by Duolingo, but conducted by outside researchers) discovered that it takes 34 hours of Duolingo to achieve the learning of an entire semester of class. Rosetta Stone took 55 hours. Therefore, gamification helped learners retain knowledge the more efficiently. Another amazing example is Fold.It. Scientists created a game in which users could try and create protein structures. This was a more complex game, using simulations to map protein structures. The game mechanic, however, was simple: the better learners did, the more points they got. As an experiment, they included an AIDS protein structure that had not been solved in 15 years. Gamers decoded it in three weeks via the game. Beyond the anecdotal evidence, there’s growing research behind gamification. There better be, with the amount of money coming out of it – according to Ambient Insight, revenues in game-based learning will rise to $7.3 billion by 2021. Gamification allowing learners to practice skills with endless patience is a key trait to the success of gamification. Learners recall just 10% of what they read and 20% of what they hear. If they do it on their own, even in a simulated environment, recall rates are 90%. 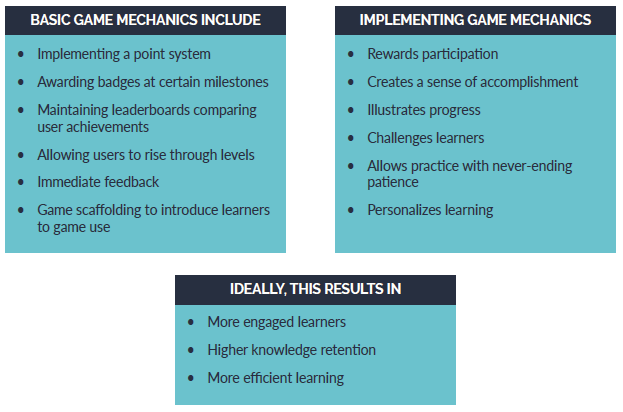 One study discovered that nearly 19 times as many learners were able to “organize knowledge and relate it to existing knowledge” through gamification than through traditional courses. On top of that, 92.2% of the learners exposed to gamification responded with intrinsic motivation. If that doesn’t signify an engaged learner, what does? The psychology behind the learning may explain it – fMRI imaging shows the brains of those participating in gamification shuts down parts of the brain that produce distracting thoughts. Plus, 89% of users believe they would be more engaged if their e-learning course had a points system, and user buy-in is a big hurdle to implementing new training methods. Users excited about new gamification processes may change their outlook on learning and create an environment less hostile to corporate training. When Does Gamification Make Sense (And When Doesn’t It)? 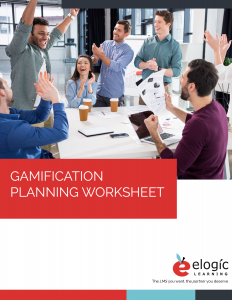 When learning and development professionals are considering introducing gamification into their corporate training, they should think about what problem they want to solve, and whether gamification can actually solve it. L&D professionals hoping to foster a corporate learning culture should focus on whether the mechanisms they want to implement will effectively improve motivation and engagement. Gamification focused on being “fun” can backfire – researchers discovered that forcing employees to play a game isn’t fun for them at all. If the gamification is more focused on quality content integrated with motivating and educationally useful game mechanisms, then employees will see the value of the training. 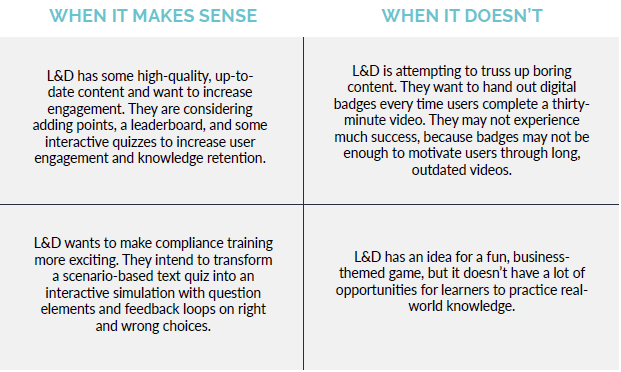 Gamification should be a part of re-envisioning L&D’s approach to guiding users through the learning, not just adding on extra elements out of desperation. Developers should also keep in mind that there is a difference between games for education and games for entertainment. measuring the success of a gamified program and/or course begins before either is designed – L&D needs to understand what results they want in the first place so as to design both with success in mind. Those same goals can be referenced later when choosing KPIs. Adoption: Look at how many gamification lessons were started vs. how many were completed, as well as how many users even registered. Look at how many users sign up for new contests and forums and compare those numbers with how active/inactive users were with the previous training program’s system. Usage: Look at how many users were engaged in the last week and which lessons get completed the most to see how users maintain usage across time. Look at which gamification features are used most often (contests, badges, etc.) to see how users are engaging with the learning system. Performance: Before incorporating gamification, select KPIs that look at the effect on user behavior and the ultimate effect on specific, measurable business goals. Compare the KPIs before and after implementation to demonstrate ROI. Don’t forget that KPIs can be non-monetary – like customer satisfaction. Be sure to evaluate results based on groups. For example, the implemented program may perform differently in other company locations, so it’s worth looking at separate data as well as company-wide data. Chris Shanks, LMS administrator at Dairy Queen, discovered an innovative way to incorporate gamification into career tracks via eSSential LMS. With 6,000 global franchise locations and thousands more employees, it can be hard to not only guide individual employees in the right training direction, but to encourage them to complete training on a continuous basis as well. Shanks was inspired by the science behind gamification and research saying that learners were likely to be motivated by moving through levels. Research says employees like to know where they stand and need information on what kind of learning they need to complete in order to move up – especially young employees like those who work at Dairy Queen (65% of whom are aged 16–20). Using the advanced personalization options integrated into eSSential LMS, she set up learning paths so as a user completes training, they automatically move up through different levels, which is controlled through the LMS’s theme functionality. When users make it to the next level, they are awarded with a badge, a different theme, and the corresponding level’s training. completed orientation yet will have a the Level 1 theme that prominently features a video on how to get started. A user who had been working at Dairy Queen for years could have a Level 3 or 4 theme showing their goal completions and the next step of their manager training. While the ‘leveling-up’ approach hasn’t been rolled out yet, DQ’s current training program has been a success, with 407,090 total logins and 35,583 unique users in the first year and a half of implementation. The 1,085 courses and library items will continue to grow as Dairy Queen continues to expand their franchise and provide training options. They expect the program will be even more successful once they incorporate the new leveling-up approach to the LMS. Gamification is a growing industry with a lot of evidence that it’s worth implementing into an e-learning training regimen. But to do so effectively, L&D should take care to ask what problem they hope to solve and which game mechanics would most likely solve them. They should approach gamification as an opportunity to approach their training in a new light, not just as an awkward supplement to what exists. This doesn’t necessarily mean building from scratch but can require creativity. 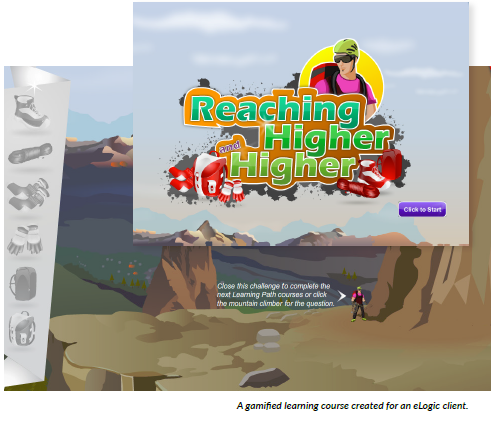 The training industry seems to be moving towards gamification of learning. Now may be a good time for L&D professionals to examine it as a possible powerful tool to take their courses to the next level and start building positive attitudes in their workforce that lend themselves to a corporate learning culture.